Since Dell Backup and Recovery is no longer free for Windows 10, to backup Dell laptop in Windows 10, you can use free backup software AOMEI Backupper Standard. In case of any data loss from virus attack, system crush, incompatible software, and accidental deletion, you need to backup Dell laptop Windows 10. We all know that there is a pre-installed backup application, Dell Backup and Recovery, on almost all Dell’s desktops and laptops. You can use it to backup and restore your computer for free. However, things will be different if you upgrades your computer to Windows 10. You will receive a message from Dell saying that you need to upgrade to Premium edition if you want to backup and restore your current version of Windows. 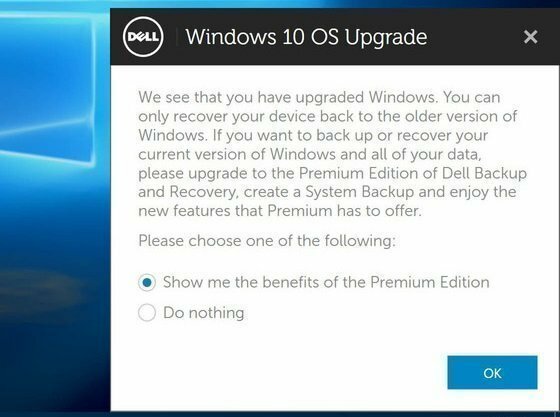 As the message states, you can only restore your laptop to previous version of Windows (not Windows 10) unless you purchase the Dell Backup and Recovery Premium. If you look deep in the internet, you can find a perfect alternative backup program for Dell laptops running Windows 10. AOMEI Backupper Standard is a free backup and restore software that completely supports Windows 10/8.1/8/7. It provides 4 ways to back up the data on your Dell laptop, System Backup, Partition Backup, Disk Backup, and File Backup. You can backup windows 10 to network folder, local hard disk, or external hard drive. It has many thoughtful built in features that allows you to do a backup or restore effortlessly, such as, incremental/differential backups, bootable rescue media, PXE boot tool, dissimilar hardware restore, etc. Compared with Dell laptop Backup and Recovery, AOMEI Backupper Standard has many advanced performances. For example, it allows you to clone or restore a system backup taken from a UEFI based computer (GPT disk) to a BIOS based computer (MBR disk) while keeping it bootable. Although AOMEI Backupper Standard can backup to critical volumes, it is highly recommended to save backups to where no backup source exists, such as external hard drive or network drive. With its intuitive interface, to backup laptop with AOMEI Backupper can be every easy. Let’s get started. 1. Download, install and open this free laptop backup software. Click Backup tab and then select System Backup. If you want to back up the entire hard disk, click Disk Backup instead. 2. Select a location to receive the backup as this program will include the system partitions in the backup automatically, which will be displayed at Step1. 3. If you want a scheduled backup, click Schedule to configure one. You can also click Backup Optionto see more additional backup settings. Then click Start Backup to start this backup process. Usually, to backup dell laptop in windows 10 only takes a few minutes. Additionally, you can still use your laptop while the backup is in process. Besides backup and recovery, AOMEI Backupper is also capable of cloning operating system, hard drive, and partitions.